Spaghetti squash tossed in grape seed oil, topped with lentils, tomatoes, and spinach. Notes: So what makes this near-vegan? I cooked the lentils in some delicious broth made from the Thanksgiving turkey (sorry!). Technically, this was also a gluten-free meal too, so there you go health trend people and celiac sufferers. Feast away. For the uninitiated, spaghetti squash is an actual squash that when cooked can be stripped with a fork to create strands that look like spaghetti. I’d take it over store-bought spaghetti noodles any day. What this dish was lacking was a fresh bit of citrus and a dose of floral. Fortunately, the wine brought those to the party with its supple body, perfect alcohol content for food (13%! ), and fortunate dry finish in tow. This wine would most likely be beautiful with any squash based dish and for those who still need to bite into a dead animal at every meal this one works with some sausage (spicy or not) right on top. 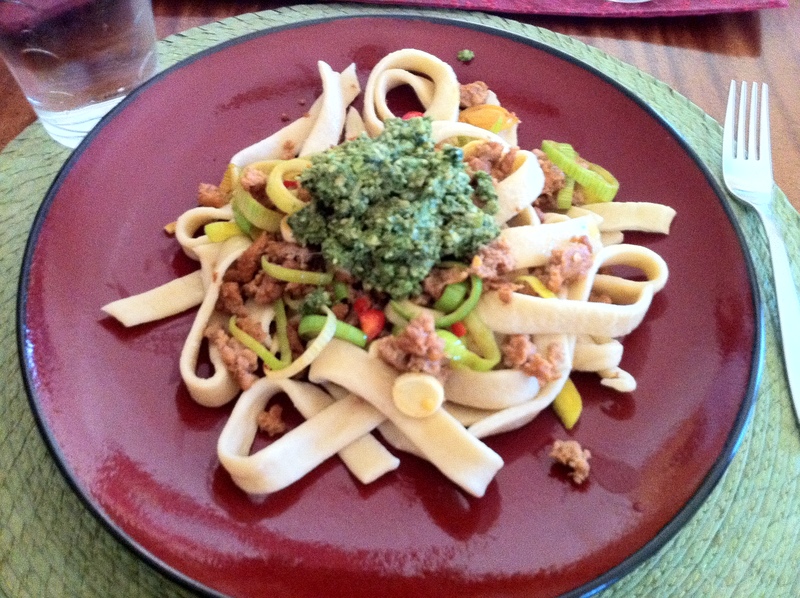 Hand ground pesto over browned turkey sausage, leeks and fresno pepper all on some homemade pasta. OK, OK…I might be slightly biased since this was the first time I’ve made pasta from scratch and it turned out to be fantastic. I made them a bit thick because I’ve been craving a thick pasta noodle for at least a year and you can’t buy them in stores and it’s certainly rare to find in a restaurant as well. The pesto, made with a mortar and pestle was also fantastic. I’ve been using walnuts instead of pine nuts and more spinach than basil recently. Try it. You’ll love it. 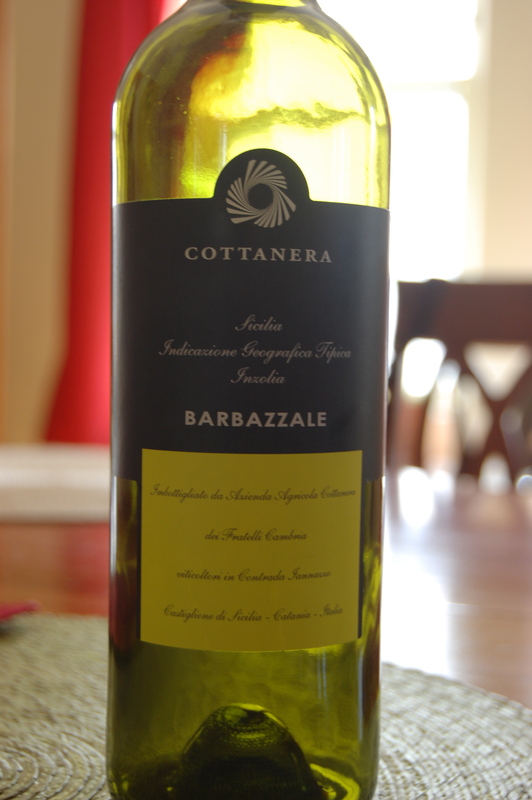 The wine was made from a grape known as Inzolia in Sicily (Ansonica in Tuscany and numerous names in other places). 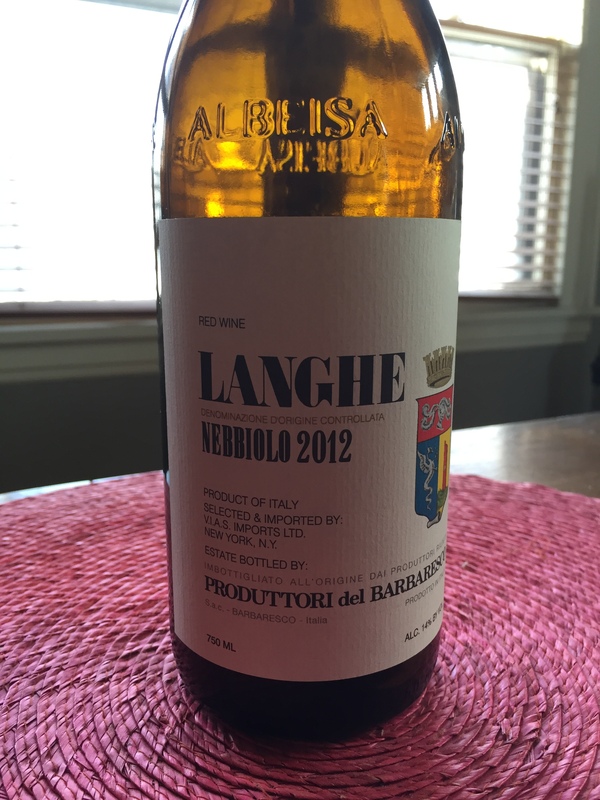 It carries a bit of nuttiness in addition to being a crisp, dry white which went wonderfully with the pesto. The finish was expansive. Always a plus.